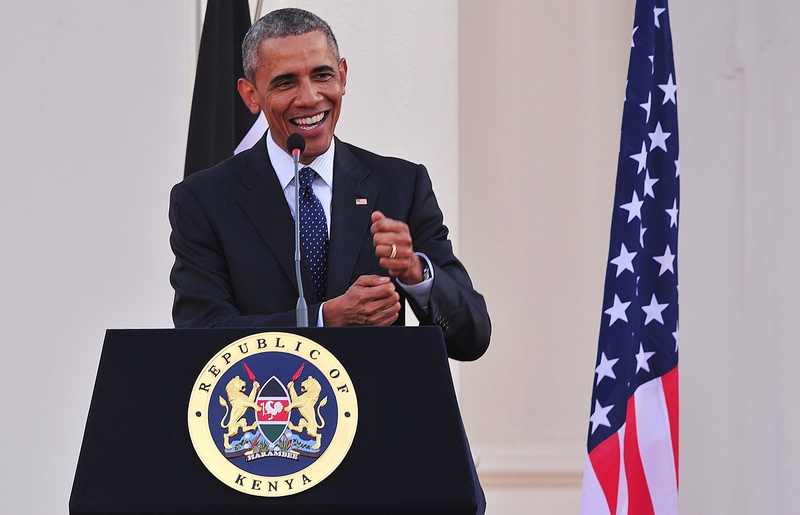 President Obama's had a busy week, by virtue of his first-ever presidential trip to Kenya. It's no doubt a personally significant experience for him — Kenya is his father's native country, after all. But it's also the country where some of America's foremost conspiracy-mongers have been insisting for years that Obama himself was born. You remember those years of impenetrable illogic, right? All those racist Internet memes? The harried shouts of "Where's the birth certificate!?" Well, the target of it all certainly remembers it: President Obama made a birther joke while in Kenya on Saturday, and it's far from the first time he's gotten in on the fun. If you're a member of the so-called "birther" movement, I'm not sure I can do much for you. But if you're the kind of person who enjoys making a little fun out of this kind of dead-end anti-Obama fervor, well, the President is with you. He's dished up some decent burns at the expense of the birthers through the years, and can you blame him? You can either get angry about the grossly racist conspiracy theory intended to prove that your presidency is illegitimate, or you can try to laugh about it. He's probably got enough on his plate to get stressed about. This one had the additional benefit of involving Donald Trump, everybody's favorite brash-mouthed presidential candidate and attention-sucking black hole. Trump had been feigning the early stages of a presidential run for a while by the time the dinner rolled around, and he'd decided to make the birther cause the most visible issue of his political brand — his feelings haven't changed, by the way. And, lo and behold, he decided to attend! It was a gutsy move, which paid off in a series of searing jokes by Obama, culminating in him releasing his "birth video." It might look a little familiar. Back in 2012, while visiting a Florida sports bar in the heat of campaign season, President Obama happened upon a table with a young boy, Andre Wupperman, who'd been born in Hawaii. The child's parents told this to Obama, which drew a warm response — he flashed Andre the "Shaka sign," and make a knowing joke, as detailed by the AP. You were born in Hawaii? You have a birth certificate? You shouldn't feel all that sorry for Mitt Romney getting a little play in one of Obama's birther jokes, since the former Massachusetts governor made a pretty bad one himself while campaigning earlier in the summer of 2012. He raised fees to get a birth certificate which would have been expensive for me. Obama went back to the birther well for one of his ever-clever WHCD zingers in 2013, explaining his plans for the eventual Obama Presidential Library. I'm also hard at work on plans for the Obama library. And some have suggested that we put it in my birthplace, but I'd rather keep it in the United States. The central claim of the birther movement is that Obama was not born in Honolulu, Hawaii — where the local newspaper announced his birth, and the place listed on his birth certificate — but in Kenya. In my experience, the city of Mombasa is the most typical claim. Which is why it's the perfect place to tease the haters, as Obama reportedly did during a toast at a state dinner, according to NBC News. Some of my critics back home might be suggesting I'm here to look for my birth certificate. That's not the case.